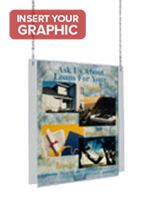 These suspended sign frame sets are a complete system for hanging letter-size landscape graphics from the ceiling. 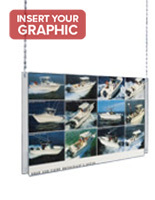 Each kit includes an 11" x 8.5" double-sided clear 1/8" thick plastic frame, two 60-inch mounting chains and all mounting hardware. Modular sign frame sets can be used alone or in conjunction with other frames and accessories to create grid-style signage. 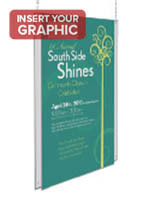 Hanging sign panels offer high visibility and can make great window displays. 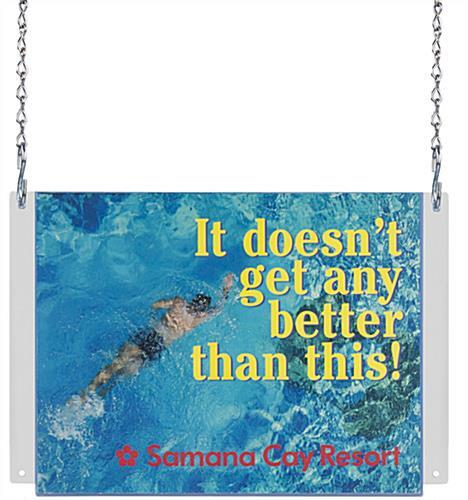 These economical sign frame sets include s-hooks for optional daisy chaining with multiple graphics. 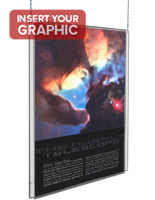 The clear acrylic frame can be used as a single or double-sided fixture as needed. 12.5" x 8.1" x 0.25"